You remind me of Pop-Pop who always had song lyrics going through his mind and many bits and pieces of paper all around. Very good addiction!!!! I’m honored to be compared to such a great man! I miss him. . . Thanks so much Debbie!!!! LOL, yes I guess words are safe addictions soooo. . . .happy writing to us! aren’t words magic? one can express so many different emotions through words. i see this post as a wonderful tribute to words and writers. i also share the same love as you. that makes two love-affairs. btw, is it two timing? as both you and me have the same love interest. glad to have stumbled across you, dear pam. Another coffee coming up 🙂 Thanks for coming over SJ!!!!! Wish we were closer! Now that would be an interesting post. 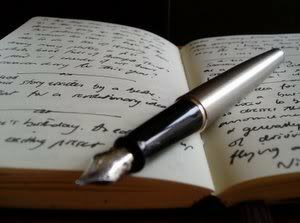 to be a writer myself. And now I think I will. Since I was 4 yrs. old when I started writing fiction 🙂 That would be a good post! Nice!!!! You should go for it! I love your writings, I wish I could find like time to write, write, write but life gets on the way. On the brighter side there are these great things they make for kids that will afford you some writing time in the shower. I don’t remember a time before the sight of a pen and a paper set me on fire,too. This affliction, addiction, and passion I share with you. Writing for a living is my goal. Thanks for sharing your thoughts with all of us. Those thoughts only serve to fan an already raging fire inside of me. Yes, Tim, I like the word “passion” because it can be good or bad depending on the day 😉 Writing is like that! From one furnace to another. . .cheers! I, for one, love your words, Pam. You make such good use of them. They are divine. I know what you mean about needing them. There was a time in my when I stopped writing for a while, and a very important piece of me was in mortal danger. Ha-ha, nope certainly not you! Not in that sense anyway 🙂 Yeah, I know, sometimes I have a hard time understanding them 😉 Relax and enjoy your coffee A!!! !